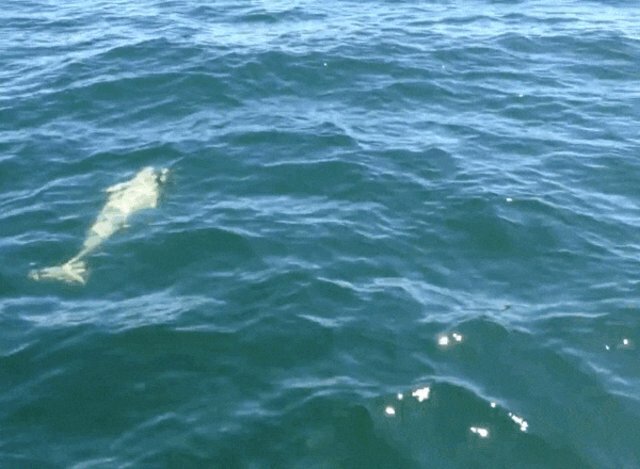 It is so rare, it has happened a mere 15 times in 100 years: the sighting of a white harbor porpoise. On June 8, the porpoise was spotted near Denmark in the Baltic Sea by a layperson who caught the animal on camera. "This is an extraordinary sighting," says Fabian Ritter, marine biologist with the organization Whale and Dolphin Conservation (WDC), which received the incredible footage. And not only was the sighting extraordinary in itself, says Ritter, but the marine mammal's behavior was equally exceptional. "This animal appears to be playing with the vessel, swims alongside it and rides the bow wave. That is quite unusual behavior for a harbor porpoise," says Ritter. "I'm not saying it's impossible," he adds, "but they are usually a wary species, and not especially interested in vessels. This is quite curious behavior." Darker-colored harbor porpoises are not uncommon in the region, and are listed as "least concern" by IUCN. One (separate) Baltic Sea subpopulation is listed as critically endangered. White harbor porpoises, however, are almost never seen. In fact, a brief but fascinating study of these sightings notes that white harbor porpoises have been spotted in 1911, 1928, 1929,1937 and 1988 in Ukraine, Scotland, Ireland and Denmark. 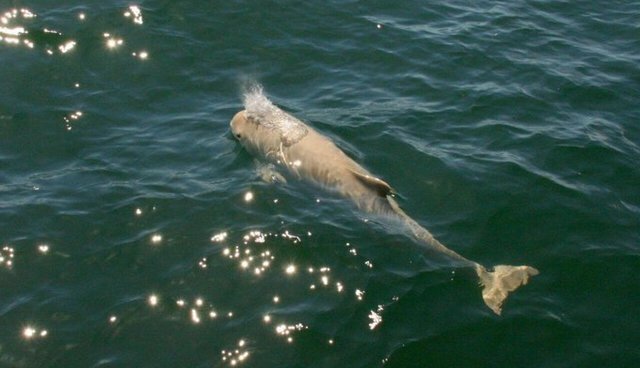 In 2007, a white porpoise was spotted underneath San Francisco's Golden Gate Bridge. Ritter explains that the white color of this harbor porpoise is due to leucism. It is genetic, marked by a partial lack of skin pigmentation. Albinism is a more extreme version of the condition. 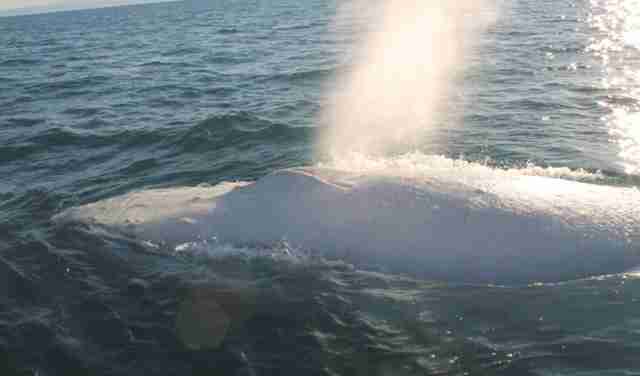 Although it is an unusual phenomenon, explains Ritter, there are reports of other white marine mammals, including an orca off the coast of Russia and a famous humpback whale named Migaloo. Although the striking white color of a marine mammal can translate into great enthusiasm from the public, having leucism or albinism can be problematic because the animal isn't able to camouflage in defense against predators. Leucism can also cause harm to vision, hearing or skin, says Regina Asmutis-Silvia, executive director for WDC in North America. But there are outside threats to the white harbor porpoise in the video, including gray seals, who want to eat them. Other threats are ever-present toxins, which can cause problems for the small-toothed porpoise's immune system and liver, and gillnets - which are used in the fishing industry. The porpoises get caught in the nets and drown, explains Asmutis-Silvia. But this beautiful porpoise has outlived all the threats so far, notes Ritter. "It appears that this is an adult. And although it's susceptible and more visible, it has made it until adulthood without being predated." Let's hope things stay that way.